You already manage student privacy when it comes to emails, phone calls and other channels. The good news is that texting is just another medium. Yes, there are a few special things to keep in mind, but it’s actually fairly simple to be in compliance. Here’s what you need to know. The two main regulations that govern privacy and texting are FERPA (Family Educational Rights and Privacy Act) and the TCPA (Telephone Consumer Protection Act). FERPA says that a student’s information is private. Typically, only staff members who have a legitimate need to see a student’s data should have access to it. What does that mean? TCPA is a bit broader, because it is not specific to higher education. It applies to everyone (prospective students, current students, parents and alumni), and puts restrictions on sending texts to mobile phones. But it’s still not hard to stay compliant. The generally accepted rule is that as long as a student or parent provides their mobile phone number, nonprofit organizations are not legally required to get explicit consent in order to text them. As NACAC says, “non-profit colleges and universities should not be concerned about compliance with this law." A comprehensive Text Messaging Policy can help guide your staff (and make your legal office happy). While every campus is different, you can use our Text Messaging Policy Template to get started. The read rate for texts is virtually 100%, but only because there’s almost no spam. If you start sending students dozens of texts that students don’t want, they’ll ignore you — just like they ignore phone calls and email, which are filled with messages they don’t care about. Even if it’s legal to text students, you need to remember that a student’s phone is very much their personal space. Every text you send needs to be timely, relevant, and valuable to them. 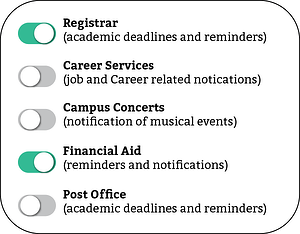 With Cadence, prospective and current students can opt-in and opt-out for texts across the enterprise through our Campus Portal, and decide which texts they want. One of the biggest mistakes you can make is giving too many people the power to text students. Every department thinks they have something important to say — but students don’t want 20 texts a day from you. They’ll tune out, fast. Typically, students want to receive texts from: Choose wisely. Only give permissions to a select few departments and staff. Really think about who has to communicate with students, and who students really want to hear from. We don’t typically recommend granting “auto opt-in” access to Student Life, Campus Activities or any co-curricular / extracurricular offices. Students can (and will) manually opt-in for these texts if they want to get them. With Cadence, you can easily set up departments and grant permissions. For example, an admissions counselor will only be able to text students in his or her territory, while offices like the Registrar will be able to text everyone (but can still target specific groups of students). This governance helps with FERPA compliance, and helps ensure that students will read your texts. It’s ironic that texting is both the most effective communications medium — and the most underutilized. 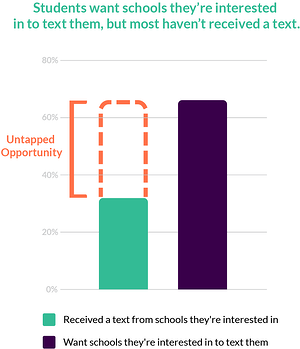 Students and parents want texts, but many schools aren’t sending them. Whether you have questions about student privacy, you need enterprise integration, or you just want to see how it works - we’re here to help.